The high quality bearings in the Testo 417 Vane Anemometer yield nearly "friction-free" rotation for direct measurement of air velocity with an NTC sensor used to determine air temperature. The vanes cover all the measured area - no airflow is lost between the vane and outer ring. The 4" head averages true flow over its entire area, not just responding to local stray eddies. Just input the duct cross-sectional area (from 0.2 sq. in. to over 100 sq. ft.) to see accurate, real-time CFM calculations. 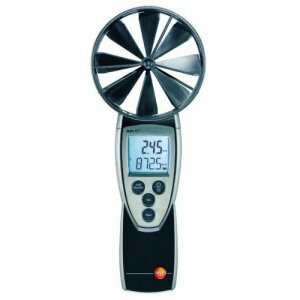 Simply toggle between velocity, CFM, and temperature readings on the clear, backlit display.